Welcome to Innovator, a Federal Highway Administration newsletter to advance widespread implementation of innovations and technologies in the highway community. Through this newsletter, the agency plans to chronicle a nationwide movement to improve the way highways are built. Growing transportation demands require a dramatic change in the way highways are designed and constructed. As FHWA Administrator J. Richard Capka put it, what's needed is a "leap, instead of creep” in the use of innovations and technologies. That's the concept of the Highways for LIFE program, a new way of approaching the business of building highways better, faster, safer and often cheaper. The $75 million program includes demonstration construction projects that employ proven but infrequently used innovations and technologies, technology transfer, information dissemination, technology partnerships, stakeholder involvement, and monitoring and evaluation. It's funded through fiscal year 2009 under the Safe, Accountable, Flexible, Efficient Transportation Equity Act: A Legacy for Users (SAFETEA-LU). “For decades, we've simply made innovations available, hoping highway designers and builders will find them and put them into use. We've found that we need to be more aggressive in our approach,” Lord said. FHWA launched Innovator as a vehicle to share information on how the highway community is adopting and benefiting from innovations. Its purpose is to help change the state of the art in designing, constructing and maintaining highway projects to the state of the practice across the country. In each issue, Innovator will focus on technologies, innovations and process changes that accelerate construction, improve safety, lower congestion, extend the life of highway projects and enhance user satisfaction. It will cover success stories, measured benefits to motorists, how-to information, program updates and announcements related to the HfL program. The newsletter will also publish articles that discuss the philosophy behind efforts to accelerate implementation of innovations and technologies. It will feature interviews with industry experts on how and why they used innovations and what they learned in the process. A temporary bridge built next to the old bridge helped keep traffic moving during a New York City DOT reconstruction project. Photo credit: Gannett Fleming Engineers and Architects. Prefabricated superstructure segments allow faster replacement of bridges such as the Belt Parkway Bridge in Brooklyn, New York. Photo credit: Gannett Fleming Engineers and Architects. 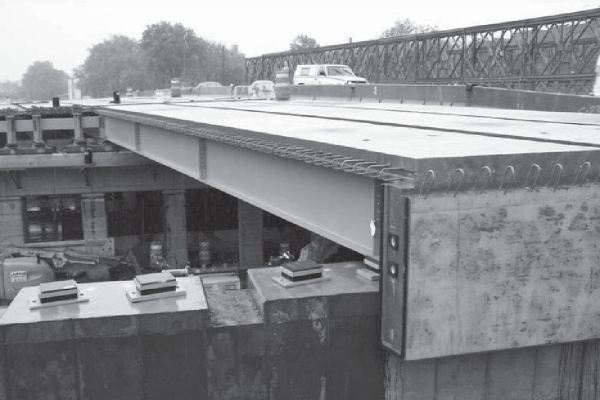 The national initiative to expand use of Prefabrication in bridge projects began when the American Association of State Highway and Transportation Officials' Technology Implementation Group chose prefabricated bridge elements and systems as a focus technology in 2001, the TIG's inaugural year. 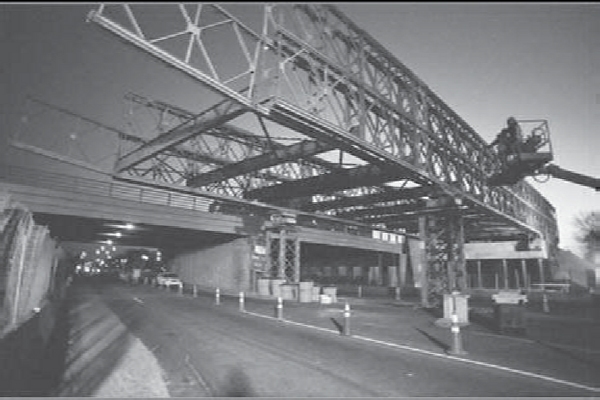 The Federal Highway Administration also named prefabricated bridges as one of its priority, market-ready technologies. Since then, the strong partnership among the TIG, FHWA, state and local transportation agencies, industry and academia has led to innovative use of Prefabrication in numerous projects across the country. FHWA's Highways for LIFE program encourages use of innovations like Prefabrication to build more durable bridges and highways faster and more safely. While longer-span bridges are part of the Prefabrication initiative, the focus is on “bread-and-butter” bridges, those with spans of 140 feet (42.6 meters) and less that make up the majority of the nation's 595,000 publicly owned vehicular bridges. Prefabricated bridge elements and systems are manufactured away from or next to the work zone and moved to the construction site for installation. Among the benefits they provide are decreased traffic disruption, improved work zone safety, less impact on the environment, greater durability and lower construction costs. In the six years since the initiative began, use of Prefabrication in combination with innovative contracting strategies has resulted in a number of examples of how durable bridges can be built quickly and economically. One is the New York City Department of Transportation Belt Parkway Bridge over Ocean Parkway in Brooklyn. 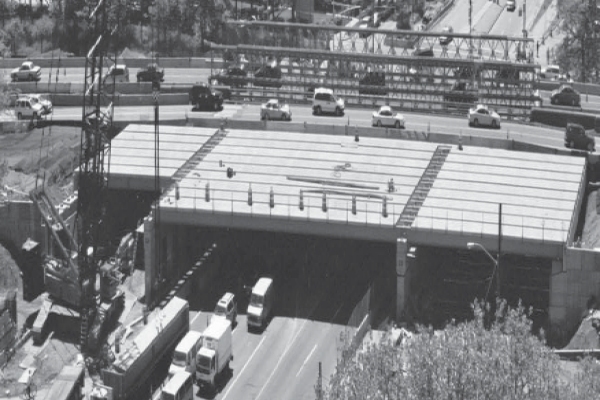 In 2004, this deteriorated bridge crossed by 166,000 vehicles per day was replaced with a prefabricated bridge in a few nights in each of four weeks, without impact to rush-hour traffic and at a cost savings of 8 percent. The bridge work on this design-build project was about a third of the total project cost. The project included replacing the existing bridge with a longer and wider bridge, reconfiguring an outdated cloverleaf interchange into a modified tight diamond interchange, and other rehabilitation and upgrade work on the parkways. The project was completed in 14 months, including a three-month winter shutdown. Construction would have taken three to four years using conventional methods. The old two-span, 149-foot (45.4-meter) long, 78-foot (23.7 meter) wide bridge was lengthened and widened to a three-span, 221-foot (67.3-meter) long, 134-foot (40.8-meter) wide bridge with a span configuration of 49 feet (24.9 meters), 107 feet (32.6 meters) and 65 feet (19.8 meters). The number of travel lanes-three in each direction-was maintained, but the bridge was widened to add shoulders and acceleration/deceleration lanes. The design-build team used prefabricated bridge components extensively to achieve an accelerated onsite construction schedule that minimized traffic disruption. Prefabricated components included concrete-filled steel pipe piles, precast T-walls, precast post-tensioned cap beams, prefabricated superstructure segments, precast bridge parapets, median barriers, and approach slabs. Prefabrication enabled the New York City DOT to replace a busy bridge with minimal disruption to rush-hour traffic. Photo credit: Gannett Fleming Engineers and Architects. High-performance concrete was specified for all precast components. Stainless steel reinforcement was specified for the precast decks, parapets, and median barriers. While the stainless steel reinforcement increased the cost of the bridge by about 1 percent, the bridge is expected to last about twice as long as the 45-year-old bridge it replaced. 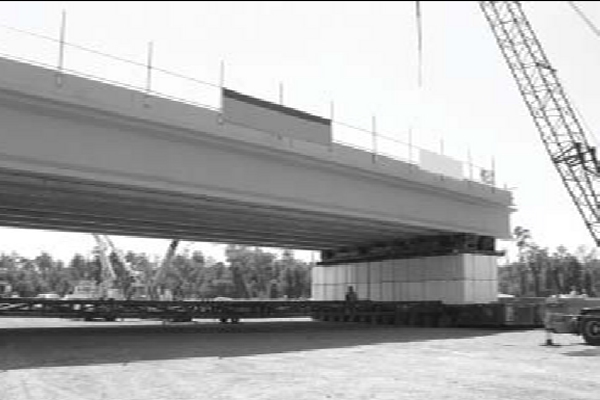 The bridge's projected 75- to 100-year service life is because of the quality of its prefabricated components and the attention to connection details. Throughout the project, six traffic lanes remained open during rush hour, with limited lane closures as needed during off-peak hours. A temporary bridge was erected next to the south side of the old bridge to maintain the existing number of lanes on Belt Parkway during the bridge reconstruction. Traffic was diverted onto the temporary bridge and the south portion of the existing bridge while the north portion was demolished and reconstructed. Traffic was then rerouted to the six lanes, three in each direction, on the new north portion of the bridge while the south portion was demolished and reconstructed. The New York City DOT used a modified A+B bidding method in which “A” equaled the bid items and “B” equaled a “critical duration” (number of days specified by the contractor) times $85,000 to translate the duration into a delay-related user cost. “Critical duration” was defined as the period of time from when the design-build team began construction until all new roadways were in their completed configuration. Incentive/disincentive and liquidated damage clauses in the contract helped ensure early completion of critical activities. The contract specified an incentive of $85,000 per day for completion before the critical duration, with a $2 million cap. Also specified was a disincentive of $85,000 per day for completion after the critical duration, with no dollar limit. Prefabricated elements used to save time on the New York City DOT project. Photo Credit: Gannett Fleming Engineers and Architects. Precast T-walls also helped accelerate construction. Photo Credit: Gannett Fleming Engineers and Architects. The awarded bid of $55.5 million was 8 percent less than the design engineer's $60 million estimate for the project. The awarded bid proposed a critical duration of only 285 days, 300 days shorter than the low bid. At $85,000 per day, the awarded bid was the best value, with a delay-related user cost $25 million lower than the low bid. The bridge was completed in just 256 critical duration days, 29 days ahead of the bid in the contract. As a result, the contractor received the maximum $2 million incentive. More information on prefabricated bridge elements and systems, including a decision-making framework for the effective use of Prefabrication for bridge projects, is at www.fhwa.dot.gov/bridge/prefab. The decision-making framework offers three formats, depending on the depth of detail desired: a one-page flowchart, a one-page “yes/maybe/no” matrix, and a more detailed question-and-answer format. (212) 788-2078 or csklavounakis@dot.nyc.gov, or Charles Norrish at Gannett Fleming Engineers and Architects at (212) 967-9833 or cnorrish@gfnet.com. Mary Lou Ralls is principal of Ralls Newman, L, L, C, and former director of the Texas Department of Transportation Bridge Division. 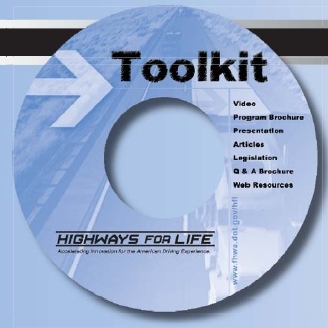 A tool kit of Highways for LIFE program resources is now available in a user-friendly CD format. The tool kit features a video, “Driving Innovation,” that introduces the HfL program. It also includes a PowerPoint® presentation, “In Search of the Perfect Highway,” that explains the components of and philosophy behind the program. In addition, the CD has several articles on the HfL program and highway construction innovations, as well as links to program information and contacts. To obtain a copy, contact the HfL team at HfLT@dot.gov. Traffic passing under the newly installed bridge the next day. When an aircraft manufacturer decides to build a faster plane, it develops a series of prototypes to test new design features in the real world. Similarly, when the Federal Highway Administration's Highways for LIFE program proposed faster deployment of highway innovations, the agency created three prototype teams to deploy what it calls “vanguard” technologies. FHWA uses the term “vanguard” because it represents the leading edge of a new approach. The vanguard technologies the teams are promoting are road safety audits, prefabricated bridge elements and systems, and making work zones work better. Prefabricated bridge elements are manufactured away from or adjacent to the work zone and transferred to the construction site for installation. They offer a variety of benefits, including decreased traffic disruptions, improved work zone safety, greater durability and lower construction costs. In road safety audits, independent, multidisciplinary teams examine existing or future roadway sections to identify potential safety issues and opportunities for improvements. The concept of making work zones work better encompasses an entire suite of innovations that improve traffic flow and safety. While these innovations are dramatic changes in how highways are built, the actual prototype is the process for deploying the technologies. The purpose of the HfL program is not to develop new technologies. Instead, it encourages adoption of high-payoff innovations that are already available but infrequently used. Reasons vary on why the highway community historically has not been quick to adopt innovations. One is limited staffing and funding for technology transfer to deliver information and training on innovations and technologies to potential users. Through such efforts as advancing vanguard technologies, the HfL program is designed to overcome barriers to adoption and use. What makes the vanguard approach different? It's more aggressive than past deployment efforts. Rather than simply making a technology available, the teams develop marketing plans, create communications tools, and conduct activities such as one-on-one meetings, workshops, and product demonstration showcases for potential users. The Florida Department of Transportation used a prefabricated bridge, built adjacent to the work zone, to speed up replacement of a bridge over I-4. 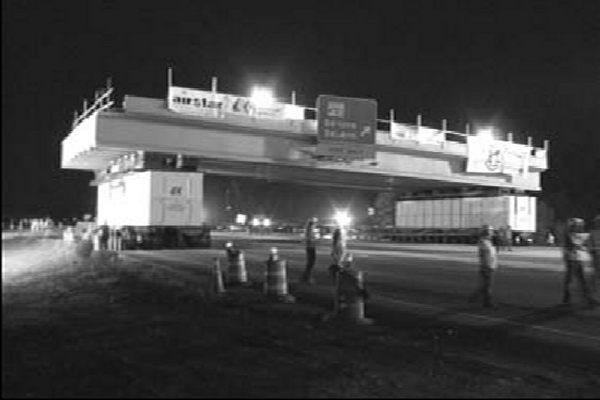 Crews move the prefabricated bridge structure into position at night. Team members make the deployment effort a job priority, rather than a back-burner task they work on when time allows. They have funding for key elements such as training courses, manuals and peer-to-peer programs. Because of the high visibility of the teams in their disciplines, opportunities to partner with other groups have emerged. The American Association of State Highway and Transportation Officials, for example, is working with FHWA's road safety audits team, creating a synergy that promises even greater acceleration of the process. How successful has the approach been? The road safety audits effort has generated results in several states already. The Arizona Department of Transportation is the first state highway agency to name a full-time road safety audit coordinator. The audit program is now championed by local government agencies, law enforcement agencies and the state attorney general's office. 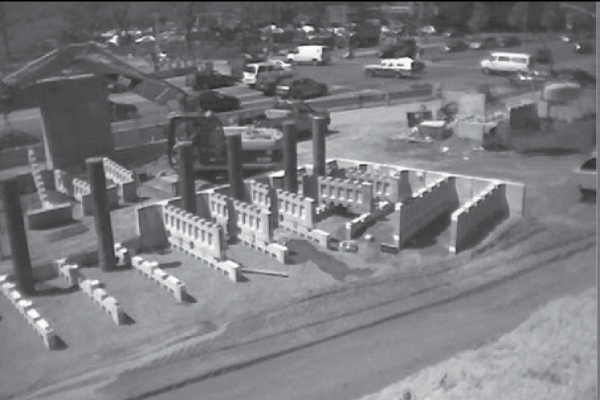 See page 1 for details on innovative use of Prefabrication in a bridge project. Future issues of Innovator will take a closer look at other vanguard technologies, including technology transfer activities and applications. The deadline for submitting applications for incentive funding for 2008 projects under the Federal Highway Administration Highways for LIFE program is July 16, 2007. Many state departments of transportation are collaborating with their FHWA Division partners to develop 2008 HfL project applications. The state project development teams are focusing on using innovative, ready-to-implement technologies on projects to significantly improve performance outcomes in the areas of safety, construction congestion, quality and user satisfaction. Projects serve as shining examples of what is possible in improving safety, minimizing construction-related congestion, and achieving high-quality, long-lasting highway infrastructure. 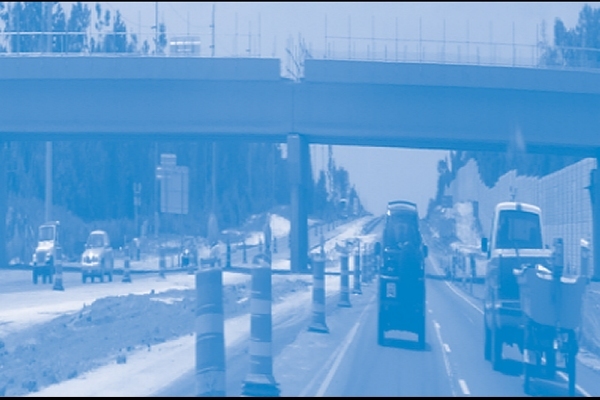 Projects demonstrate a broad array of technologies, techniques and approaches to achieving safe, high quality and long-lasting infrastructure while minimizing construction-related congestion. A project can serve as a platform to promote innovation and new technology through such vehicles as showcases, workshops, training and peer-to-peer exchange. The selected 2008 HfL projects will be announced at the annual meeting of the American Association of State Highway and Transportation Officials September 28 to October 2, 2007, in Milwaukee, Wisconsin. For more information, contact Mary Huie at (202) 366-3030 or mary.huie@dot.gov, or visit www.fhwa.dot.gov/hfl. An initiative to provide motorists with a smoother, more comfortable ride on the nation's highways is enjoying success, thanks to a combination of performance goals, marketing efforts and technology deployment. A 1996 survey revealed the quality of the roadway surface as the number one priority of U.S. highway users. Other surveys since then have mirrored this motorist concern. In response, the Federal Highway Administration launched a national initiative in 1998 focused on getting smoother pavements. Under the initiative, FHWA worked with the Arizona and Kansas Departments of Transportation to design information toolkits to get the word out about building smoother pavements. The Arizona DOT effort focused on asphalt pavement and featured NASCAR legend Richard Petty in a video, four-color wall poster, brochure, and laminated, pocket-sized tip sheet to help contractors achieve smoother surfaces. The packet included a set of contract specification clauses with incentives and disincentives for pavement smoothness. The Kansas DOT created a similar package for concrete pavements featuring Pro Football Hall-of-Famer John Madden. The Arizona DOT championed the use of incentive/disincentive clauses specifying pavement smoothness, which contractors appreciated because it rewarded them for good work. Soon, good contractors were “bidding the incentive.” They were so confident they could achieve the smoothness level needed to get the incentive that they calculated it in their bid. As a result, the agency got smoother road surfaces from contractors at much the same price it had paid before. When commercial truck drivers gave roads poor ratings in an annual survey, the Pennsylvania Department of Transportation decided to use aggressive pavement smoothness goals to get better. This two-pronged effort required contractors to construct smoother pavements and encouraged programming of projects with network smoothness in mind. Highway organizations typically use the International Roughness Index (IRI) to gauge how smooth or rough a segment of highway pavement is. IRI is an indicator of the bumps you feel as you travel over a section of pavement. FHWA set a goal to increase the National Highway System mileage rated at an IRI of 170 inches or lower of roughness per mile from 91.7 percent in 1998 to 93 percent by 2008. As a result of the initiative, the 93 percent goal was reached in 2001, seven years ahead of schedule. FHWA set a new 2008 goal of 95 percent of travel with a ride quality of 170 inches or lower of roughness per mile. In addition, every state now has some sort of pavement smoothness specification. Advances in pavement measurement technology have furthered the smoothness initiative. For years, measuring highway smoothness required walking a piece of equipment with a wheel on it. Later, measurement devices were attached to vehicles to measure pavement at highway speed, making network-level surveys possible. 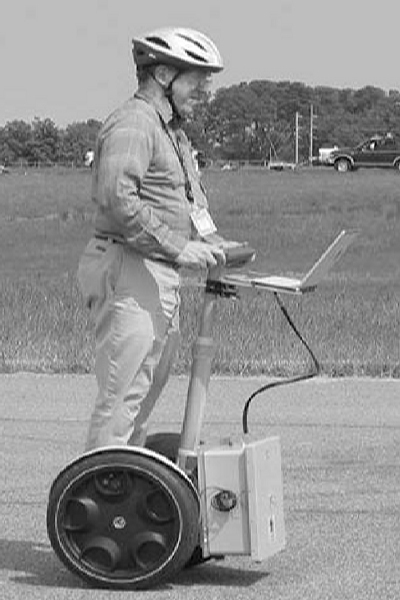 Recently, FHWA developed a profiler that consists of a measurement device attached to a Segway® Human Transporter for project-level measurements. Today's efforts focus on going beyond the level of smoothness drivers can discern, according to Mark Swanlund, senior pavement design engineer in FHWA's Office of Pavement Technology. In addition to increasing driver satisfaction, smoother pavements enhance safety and result in surfaces that last longer because the impacts of heavy trucks are reduced.